Russia - Central Asia: Internet access via two-way dish. Including: Romania, Russia, CIS, NIS, Armenia, Estonia, Moldova, Croatia, Slovenia, Armenia, Azerbaijan. Belarus, Kazakhstan, Kyrgyzstan, Republic of Moldova, Russian Federation, Tajikistan, Turkmenistan, Ukraine, Uzbekistan. BusinessCom | Internet via Satellite services for the Russia region for SOHO, Enterprise, Internet Cafe and Calling Centers, Wireless ISP and Hot Spots, VoIP Termination Carriers and more. No FAP, no throttling, no hidden fees, smart bandwidth management, dedicated technical support and personalized service - this is what BusinessCom services are.
. Ready to support business-class VoIP and Videoconferencing, VPN (IPSec), Mesh topology and more.. Contact us: vsat-satsigs@bcsatellite.net to inquire for more information and prices. Regions and Countries covered (but not limited to): All ex-USSR (CIS), including Ukraine, Russia, Armenia, Azerbaijan, Moldova; Middle East, including Iraq, Afghanistan, Lebanon; All Asia, including: Pakistan, Bangladesh, India, Thaliand. 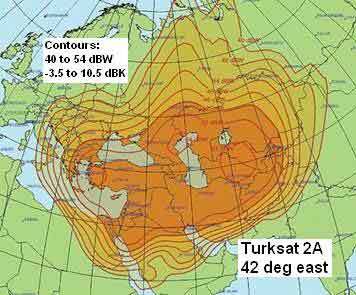 One-way satellite broadband download is available for private use, for companies, and institutions for the whole of Turkey, Georgia, Armenia, Azerbaijan, Turkmenistan, Uzbekistan, north west Iran, Cyprus, Israel, Palestine, Syria, Lebanon, and Iraq. So called "One way" operation is unusual and requires you to have a dial up telephone modem for slow internet access plus a receive only satellite dish connected to a DVB card in your PC for high speed internet downloads. The satellite dish requires an LNB, the same as that used for satellite TV reception. You do not require a transmit licence. Satgate offer an interesting variety of tariffs to match the smallest to the largest customer requirements. Pre-paid per Gbyte, (128k - 1024k), is ideal for users desiring to pay for the limited amount of traffic received with the guaranteed bandwidth. The tariff varies during the day and savings may be achieved by avoiding big downloads during the peak periods. Low monthly tariff (max 256 - 768k) is Web surfing and participation in the interactive chats, communicate to other people using ICQ, MSN and the like but without guaranteed bit rates. Higher monthly tariffs are suited to clients who need a rapid download of large data volumes. Guaranteed continuous information rate (CIR) is offered between 8 - 256k, with bursting to maximums of 256k - 2048k. Traffic packet based tariffs at 1024 and 20048k are offered, suitable for occasional network back up purposes. Dedicated CIR rates are available for larger business and ISP backbone connections. SCPC, DVB, DVB-RCS and D-TDMA Enterprise Connectivity Solutions. D-TDMA services for Internet Cafe, Calling Centre and ISP business from 64 kbit/s up to 4 Mbit/s with SLA Quality Guarantee, QoS, business-class Voice over IP and Videoconferencing support. 98.2% annual network uptime. Professional backbone connectivity to UUNet, Level(3), TeliaSonera with prices at 1200 US$ per 1 Mbit/s CIR. 99.95% annual network uptime. Available everywhere within our coverage map. Regions and Countries covered (but not limited to): All ex-USSR (CIS), including Ukraine, Russia, Armenia, Azerbaijan, Moldova, East Germany, Croatia, Serbia-Herzegovina, Bulgaria, Romania, Refer to the coverage map for the availability in your region. 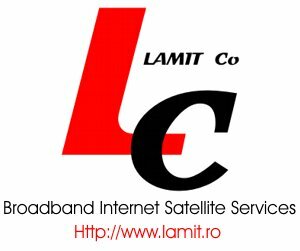 Broadband Satellite Internet Services, in Romania, Europe and the Middle East, with bandwidths ranging from 512 Kbps up to 2048 Kbps (Home, Business and Corporate) and Dedicated bandwidths of up to 8192 Kbps. The type of connections, adapt to any building, without the need of additional cabling (beside the existing one), as the data is transmitted by WiFi (wireless) or existing telephone lines. Beside this, by using the Wi-Fi technology, you facilitate the building and implementation of new network sections, either in choosing to become a small ISP, or owning a corporate network. We also offer the latest technology, in early warning system for earthquakes. The customer premise terminal (CPT) or satellite interactive terminal (SIT) comprises a sat antenna dish, similar to satellite TV, together with an indoor box unit. Ethernet cable or USB cable links one or more local PCs. The arrangement is suitable for both home use and for small office applications. The radio modules on the front of the dish receive the out link (or downlink) using a conventional sat. television LNB (low noise block down converter) and transmit the return link (or uplink) data using an outdoor transmit block up converter (BUC). The wireless service is always-on direct access and not dependant on dial up or ADSL lines. 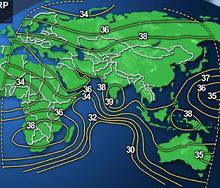 The hub dish is where the VSAT Operator and ISP providers are located with a very high speed digital backbone for worldwide networking connection. Ku band refers to 11-12 and 14 GHz operation. C band (4/6 GHz) needs generally larger customer antennas but suffers less from heavy rain fading in the tropics. Have your say now. Contribute to my Satellite Broadband Forum. Help others with advice. Contribute your own problems, successes, failures, wants, sales etc. "Satellite Signals", "SSL", "Sat Sig" and "Ivsat" are TradeMarks of Satellite Signals Limited. Copyright (c) SSL 2003. All rights reserved. Images are displayed with permission of the respective companies.